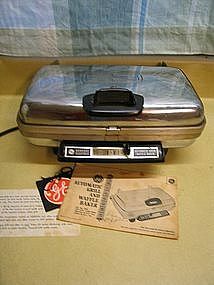 Vintage General Electric Automatic Grill and Waffle Baker Model G-44. It comes with the original tag and booklet which gives instructions in use and care, as well as several recipes. The booklet is dated 1962. It heats up, but I've not had a chance to make a batch of waffles and give a complete test. The last time I made waffles using it, was 1993, and it worked just fine. The removable reversible griddles are not the non-stick type. There are some usage and cleaning marks to the chrome. Complete condition photos by email. I need your zip code to calculate the postage.